This group of buildings is hidden away from the public, mainly due to its location and function. 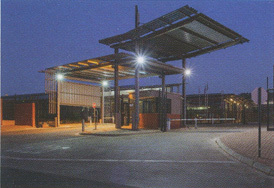 It is situated southwest of the better-known Military Headquarters' buildings, adjacent to one of the southern entries into the historical core of Pretoria. Even these headquarters had a much better visual and symbolic presence in the public domain before an engineering 'solution' to enable traffic efficiency was implemented, leaving it largely obscured from the public view. In order to create this new facility for the SAMHS, a long and complicated process commenced in 2008, with completion only being reached in mid-2014. The scale and complexity of this 30 000m2 building can be shown in the extent of the team involved - the combined professional team consisted of approximately 100 people, while +/-1 500 construction workers laboured on site. A heritage survey on the site, which contains a collection of historical buildings, found that many structures had to be retained and restored in keeping with heritage legislation. These buildings consisted of, for example, a railway-type platform building characterised by a loading platform around its entire perimeter. Timber cantilevered trusses support the roof of the platform; another feature is the large timber sliding doors. Another heritage find was a group of Bellman-type steel aircraft hangers, of the type that originated in Britain, in 1936, as the standard WWII hanger. This structurally efficient building could be made off-site and moved to wherever was required. Many were made in South Africa and exported abroad. They were, ideally, manufactured in modular steel sections that could be dismantled, transported and reassembled. Some of the aircraft hangers were kept and restored on site, while others were dismantled and taken away for use elsewhere.The rectangular railway-type building, with its long side facing north, was restored. A stroke of logic and genius lead to the retention of the eastwest street space adjacent to this building's south side. It is here, within the 'empty' urban space, where much of site memory is retained and exemplified. This area now forms the organising spatial logic of the new facility. The space orientates the user and forms the core of all social interaction. Adjacent, the architects have created a long covered walkway on one side and colonnades of trees on both sides that define this central space, while it also binds together the various functional elements. The area's focus is the large roofed, but open, parade ground. A restored hanger structure has been employed for this purpose. Most of the new structures are large, inwardly orientated storage-shed-type warehouse structures, for storage of medicines, medical equipment or vehicles. They are largely devoid of people, as most of the contents are handled by electronically controlled mechanical equipment. The cathedral-like spaces are meticulously crafted to exacting standards. Where people interact daily with the building, the architect's attention to detail shifted to make the experience as humane as possible. Consequently, the difference between the mechanically orientated spaces and those used by humans is distinct and noticeable: those occupied by people have ample daylight, direct contact with the outside and are full of colour and 'warm' materials. The architectural form, tectonics and detailing of the group of buildings is direct and robust, with a focus on durability over time. Much of this is in keeping with what has been found on site. Specially commissioned artworks, ranging from sculptures to mobiles, mosaics and photography, have been placed all over the more public spaces and underpin the medical function of the buildings. The artworks also depict the human and humane actions that might flow from military medical services. Despite the project consisting of a large number of buildings, completed over a long period of time via what must have been a complex and taxing process, the results nevertheless give testimony to the fact that the architects and other professionals on the team were not prepared to give up on their ideals, and continued in their resolve to achieve a positive and inspiring outcome through every twist and turn. However, this project has managed to achieve the exact opposite of the mundane environment that usually results from the aforementioned attitude. Somehow all concerned, and especially the architects, managed to retain their enthusiasm, passion and professionalism in order to achieve an end product that would rise above the average. What has been created here is an environment of sustainability, efficiency, robustness and enduring delight and intrigue. Maybe the most distinguishing quality of the building is that it has created an environment of excellence for those members of society who are often overlooked. By its very nature, the military comes across as a big and impersonal machine. Yet here the architects managed to change that perception and create an architectural context where the 'average' man and woman are celebrated for their individuality and humaneness. As such, they have made a better place for all of us - even if so few of us will ever come to experience this enchantment.